AWSOME man just AWSOME ... 12kg is a decent saving for $100 ! If only you could buy weight reduction by the dollar at that rate huh . yeah Daniel- you could spend less than $30 and no longer be in triple figures!!! Bugger me; it has been a long time. I am currently in the planning and saving part of the “development cycle", LOL. I have essentially stopped all spending (for about the last six months) to save some cash and take stock of what actually needs doing. I want to get into carbon fibre, and that stuff is expensive. It is between $60 and $75 a meter in short lengths. If you buy in bulk it can be up to half that price. I can get 100m delivered for $3700 from playwithcarbon.com. That is a significant outlay, hence why everything else has stopped. I have bought a couple of new books: Tune to Win by Carroll Smith, and Race Car Aerodynamics: Designing for Speed by Joseph Katz. I have also been digesting everything I can from DTM and current time attack leaders. I am happy to see the somewhat controversial Nemo Racing “car” has a similar skirt treatment as I was trying to achieve 6 months ago. Makes me think I am on the right track, as Andrew Brilliant is something of an expert. I have read everything I can from him and Simon McBeath. One thing they agree on is you can get good results intuitively if you lack the funding to test in simulations or wind tunnels. They also say if you don’t have a big budget, copy someone who does! The tyres are shot and need replacing. A set of wheels are about the same price as tyres, so the question is: is now the time to review the wheels and maybe go to something bigger. 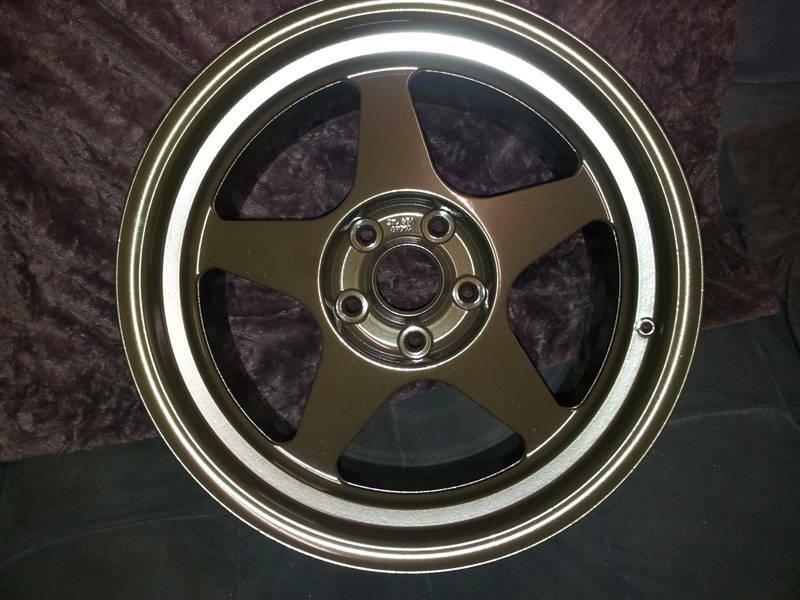 There is a set of second hand 17x9 and 17x10 Desmond Regamasters (at 7.4kg each) that I have my eye on. Another option is the Enkei RPF1s which are around $1400-1500 for a full set in a similar size brand new, and they are similarly weighted. Do I go 18s? Tyres are about 15-20% more expensive in 18inches, but that may change. Once the wheel/tyre thing is decided, I will set about designing/modifying the guards to suit. The fronts should be OK, as they are pretty cavernous. I want to finalise the front guards before taking a mould and doing them in carbon. The rears may need a little width, depending on the offsets. I want to cut away the lower section behind the rear wheels and add DTM style vanes to control and gain some advantage from the air leaving the wheel arch and coming in from the sides. The bonnet vent still needs to be pulled forwards before a mould is taken and the new bonnet is made in carbon fibre. The boot will get a little spoiler along the lines of the factory item, but fully integrated to give a clean edge for separation as well as assist the diffuser and wing. It will also be CF. The side skirts need cleaning up- I am happy with the concept, but it could have been executed better by me. It all needs to be tied together with a flat floor. This will likely be fibreglass. Let’s be honest- you can’t see it so there is no wow factor and it will cop a beating. This is why the glass front bumper/splitter/undertrays will stay. I have the spare shell ready to be used as a plug for a lot of the panels, floor etc. I will cut the back of it up and play around with the diffuser, guards and boot area. Paul linked me the “Mad Mike” build article. He had a similar issue to me- a lot of bent sheet metal at the rear. His solution, cut it all off at the shock towers and replace with a tube space frame. This might be something to consider. 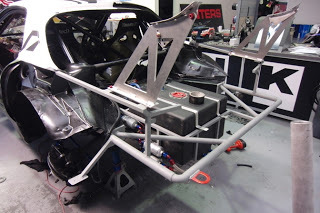 Wing mounts directly attached to the frame welded to the rear towers, and the new panels all hung from the frame. No compromises as to where stuff goes. You do not need a calculator to realise I have spent around fifteen or twenty grand and six months labour in the above text. Clearly I can’t do it all, so stuff will be cut, plans modified, and postponed. What this isn’t though is another one of those ‘gunna do this, gunna do that’ threads. The car is going to go through another major overhaul. I might have to take long service leave to achieve it though. Ideas and thoughts are always welcome. Ohh, I need a fuel system too. Fuel cell, surge tank, pumps, fittings, etc. Might have a look what Andrew and others have done. here is the red bull mazda rear. Do you have your rear cradle re- installed yet after fitting the solid bushings? All the fuel lines and system will be much easier to install with that out plus cutting up the rear guards. If you want to borrow my guard roller I will post it to you FOC. I had to slice away the whole inner arch to flare the rear but will fit much wider wheels. These new ideas of yours bring new inspiration to a dating chassis and makes me believe that alot of the soarers heavy chassis can be cut away and leave a very competitive car. Thanks for the motivation. Yeah, the cradle is in, and everything is back together. I am hoping to use the factory fuel lines and just connect the cell, surge tank and pumps to it. I havent got in there and had a good look yet. Need to get all the kit together over the coming months. Once that is done the factory tank can come out and i'll see what i am working with. Thanks for the kind words and the offer. I'll keep it in mind. Are there pics of the work you did on the rear guards? I'll havea look around here. 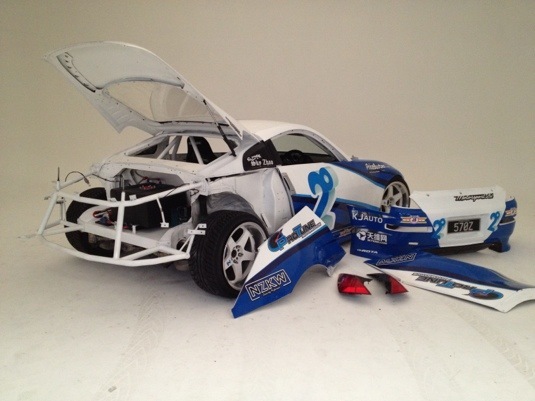 Hey Ben, FYI that Red Bull RX7 is just one NZ drift car that is made up of a front and rear space frame. Here is a 350Z http://www.dspec.co.nz/570z/cover-feature-nz-performance-car/ After going to a drift event back in Feburary last year it is a fairly common thing for this type of set up amongst the pro field so if you need any inspiration or ideas have a search of the NZ drift cars. So reading Carroll Smith got me interested in roll centre again. I have been humming and harring about buying adjustable LCAs. The Ikeya ones have a roll centre adjuster built in to them. My understanding is the name is a bit misleading. You don't have roll centre adjustment as such, but they space the ball joint down, thus raising the roll centre back closer to factory specs. 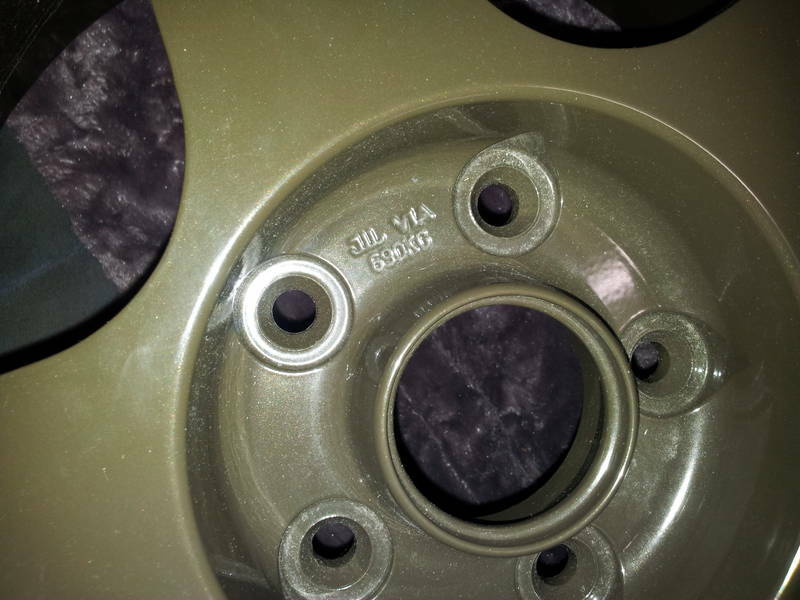 (The roll centre is generally placed fairly low with our suspension design once we lower it.) I realised all this whilst reading suspension books in 2011, but my focus switched to body work mods last year and it fell by the wayside. Seriously considering buying the Ikeya formula Arms tonight. James, I looked at that link. I have been searching for some better pics- that site is a pain to navigate. Looking at those pics, plus pics of Mad Mike's car is getting my creative juices flowing. I want to cut  up. LOL. here is the best pic I can find of the car James linked. I think this design better suits the shape and position of the Soarers rear bumper in relation to the boot lid. Careful planning and some time with the tape measure will be needed to ensure the best use of space is achieved. ie I want to run a big diffuser, so the lower rear bar might need to go, or be sectioned so that the diffuser angles are not compromised. I might also make another exhaust (the fourth???) so that the exhaust is centrally mounted directly over the top of the diffuser. All just distant plans at this stage. got my hands on a set of new wheels this weekend. I now have a set of Desmond Regamasters. The previous owner had them powder coated in Dulux Precious Bronze Pearl. Not sold on the colour, which is probably why they sat for so long on the market. I have been watching these for a while and eventually made him an offer he should have refused. I m now fighting the temptation to rush out and buy tyres just so I can fit them. 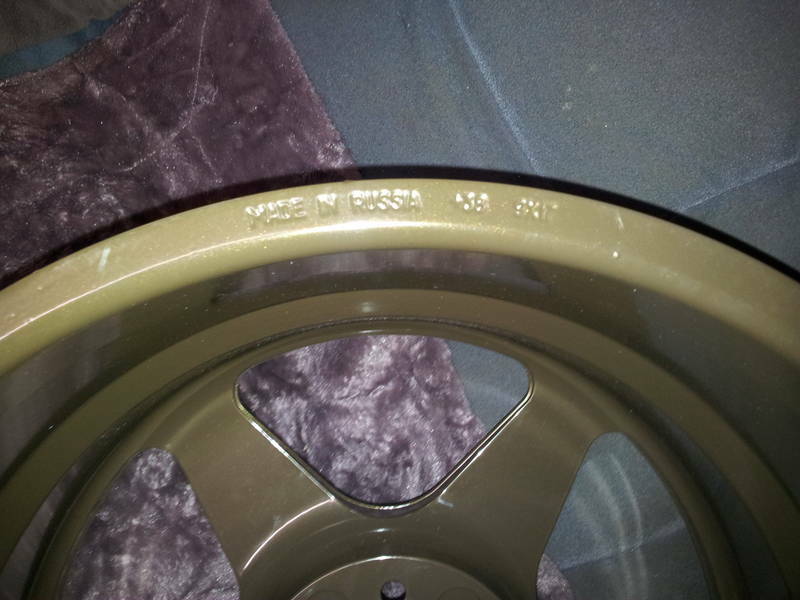 My Supra ones are 10kg as well, so I will have made an actual weight saving of near on 10kg all up. That is assuming wider tyres are no heavier...lol. 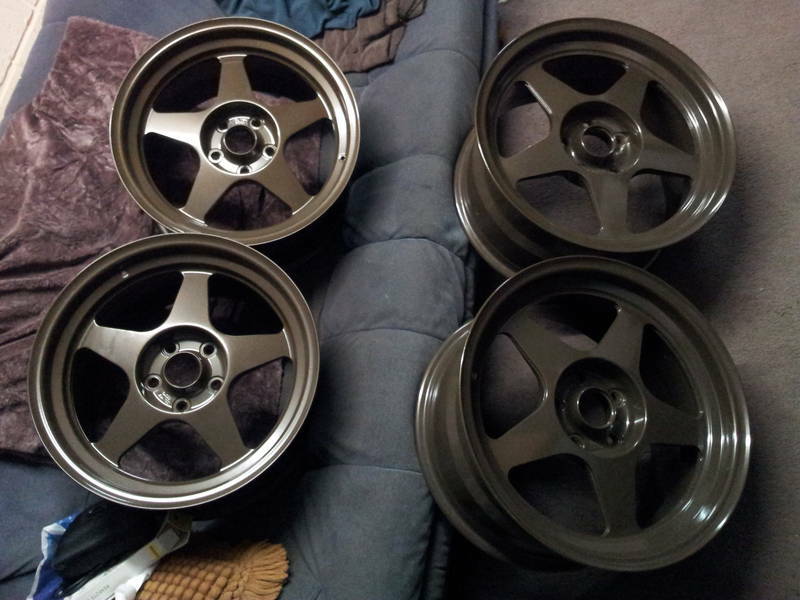 If I did not get these rims, I was going to shop around for ENkei RPF-1 in similar sizes. They are almost the exact same weights, and a set can be had for under $1500 if you do your homework. All the monies saved from what I have budgeted are being tipped into the car anyway, to buy items I want, but couldn't find the money for. Like Ikeya Formula roll centre adjuster lower control arms. just think carefully before you go making large investments in the body, if you plow a wall a re-shell becomes another MAJOR investment (if you don't plow a wall at some stage your not close enough to the edge! ), have a look at chasers WTA EVO 6 not a huge amount of chassis mods, good aero, lots of power and forgiving to drive. being a realist is rarely "positive" I have seen lots of half finished cars over the years and guys that go all-in and then while getting seat time back it into a wall and lose it all. Oh yeah Allen, Ben is really one of those "half finished" kind of guys! He's the one guy on these forums that does heaps of mods AND gets heaps of driving time. Whatever work you want to do on YOUR car Ben, go for it mate. You're a big boy, and you know the risks of going hard. I know how hard you work to save the $$$ for your hobby, and how much work you do on the car yourself, so give it all you got buddy. Space frame the front and rear ends if you want. I've been researching along similar lines. Might send you some photos. ... and you will note I did say "Think Carefully" not don't do it, gezzz guys!!!! Allan- I get it. And I agree. The recent WTAC rule changes have caused me to pause and think about what I am doing. I have no inclination to spend hundreds of thousands of dollars to compete at WTAC, but if some of the local competitions follow suit then there could be issues. I have found that as I get older, I seem to enjoy working on the car as much if not more than driving it. More honestly, I don't enjoy driving it if I am not getting faster, or the car is not doing what I want it to do. I much prefer 'lapsrint' events to 'time attack' format. 5 hot laps at a time are better for me than a single fast blast. Better yet are private test days where I get lots of laps to try stuff. Andrew- I don't think Allan meant anything personal by his comments, and I welcome his, yours and everyone's advice, comments, suggestions and offers. I really like seeing posts on this thread. I keenly follow a few other build threads looking for inspiration. Unfortunately the nature of my life means I have fits and spurts of both time and money. Like most people outside the boardroom, I have more time than money. This means that making huge (reliable) power is generally beyond my capabilities. Making body mods, adding lightness (man I love that quote! ), and 'parts changing' are stuff that are labour intensive and therefore are things I can afford to do. WHere I have to engage the services of professionals, or buy expensive items, I try to ensure it is a 'do it once' proposition to allow headroom for the future. I bought a track car so I could try and keep out of trouble with the law, after some trouble with the law in the past. Initially I took the shiny go fast gear off my street car and put it on this. I investigated IPRA, only to discover that you must drive a pre 1985 australian delivered junker to be allowed to compete (not exactly accurate but seems to be the line of thinking from CAMS). Andrew got me interested in building a Sports Sedan and I started work along those lines. Alas, I keep moving to areas with absolutely no Sports Sedan Competition. SO I decided to just do what ever I wanted (mods and events). SA has few events to enter, so I fell into Time Attack and so long as I am way down the bottom of the field no one cares what I do to my car. WTAC rules may change that in the future if they filter down. I will have to choose a path one day, until then I will keep doing my own thing. I am sorry for any offensive tone in my post Allan. Extreme pain and strong medication are to blame.